In 2014 it was the centenary of the start of WWI. A meeting took place to discuss how the village of Tupton would mark the events over the 4-year period covering WWI. A project called ‘Lest we forget’ was set up. 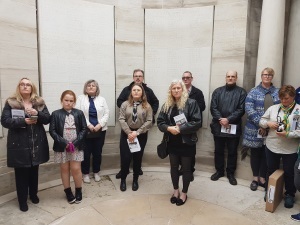 The initial action was to research the 42 names of the soldiers listed on our war memorial, and to date 40 of the 42 have been traced. All the information gathered has been put on display on this site. This information has then been used for special remembrance day services in November 2014,2015 & 2016. A copy has been sent to Tupton Hall School for their projects, and it has also been used for a display in the St Johns church. 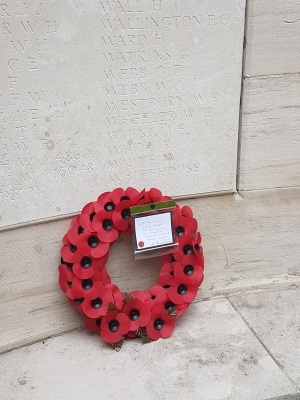 On the 100-year anniversary of the death of a Tupton WWI soldier, the village flag has been flown at half mast, and a board of remembrance placed alongside the flag pole. This act has been carried out for the last 3 years by 1st Tupton Group Scout leader David Parmley, and Parish Councillor Stephen Peters. It will continue to end of the centenary period. 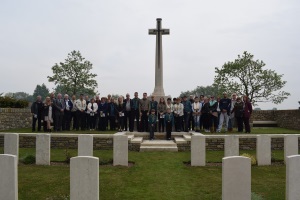 On this day, a coach containing 43 people from the village of Tupton visited 3 WWI cemeteries in France. Funding for the visit was kindly gained from Tupton Parish Council, and Rykneld Homes. This enabled a coach to be booked from Andrews Coaches of Tideswell, and an extended day trip was planned, by David Parmley. All the village Groups and Societies were invited to send representatives, so as the visit of remembrance would be from the entire village. The following groups were represented. Plus some relatives of the soldiers we were visiting. It was an early start leaving at 3.30am to catch the 9.25 am ferry to Calais. Once in France we had approximately 5 hours to visit 3 cemeteries. 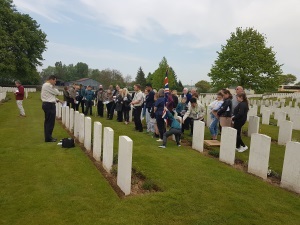 At each cemetery a short service of remembrance was carried out by Reverend Ann Anderson & Reverend Marcia Bown, and a wreath was laid by a member of the Group. The last post was then played. 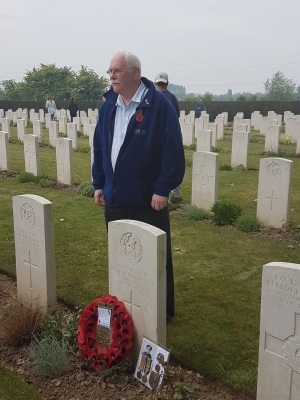 The last cemetery we visited, containing William Thomas Bate was really special, as we had the soldier’s nephew, Keith Greatorix, with the group. Keith was in possession of private Bates war medals, plus his leather ID badge, pocket watch chain and personal items pouch. These last 3 items were removed from his body when he was killed, so it was very moving that they were returned to this location for a very short period. The following graveyards containing Tupton soldiers were visited. George Hapers grave is one of 7,000 graves in the Cemetery. This cemetery is located 1 mile south of the village of Souchez. 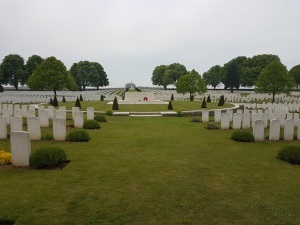 It contains the graves of 7661 British soldiers. 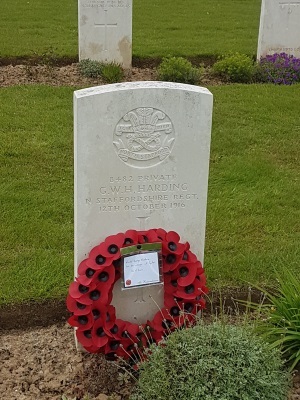 George Henry Harding is buried here. George was born in 1883 at Mow Cop, Staffordshire. At some point the family moved to Beighton, in Derbyshire. George married Lillie Ward Jones and set up home in Beighton having 6 children. 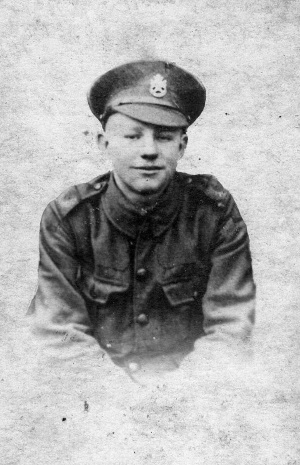 George served with the 1st Battalion of the North Staffordshire Regiment, and was attached to the 72nd company, Machine Gun Corps. After his death his wife and children moved to Tupton and lived at 56 Ward Street. This is where Lillie’s father was now living. 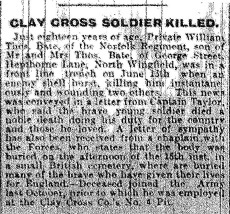 Tupton soldier Gladwin Jones from 56 Ward Street, also died in WWI. He was Lillie’s half-brother. Two of George & Lillie’s children are buried at North Wingfield church. There are still relatives of the family living in the village. The memorial is located 1 mile west of the village of Loos-en-Gohelle, and 4 miles north of the town of Lens. 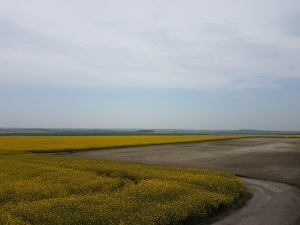 It is situated where the trench system of the German front line once stood. This area was known as dud corner, due to the large number of British shells which failed to explode during the battle of Loos. The memorial lists 20,615 names of the soldiers whose bodies were never recovered from this area, over the 4-year period. 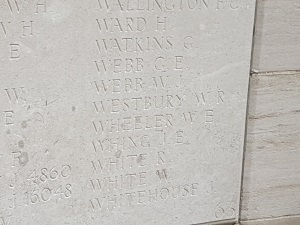 Walter Ralph Westbury is remembered here. 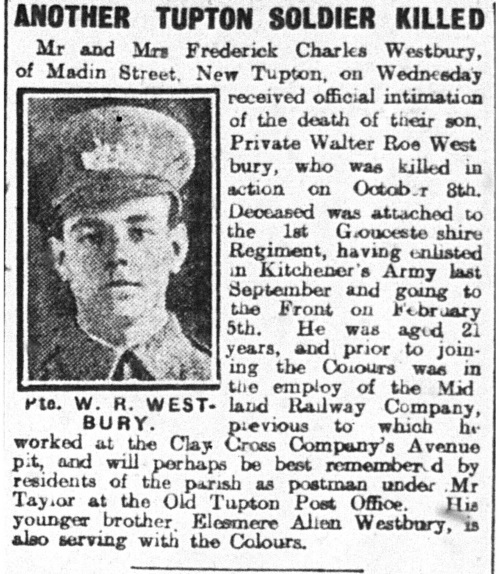 Walter was born in 1894 at Charlton, Worcestershire. At some point the family moved to Tupton living at 8 Madin Street. Walter worked for the Midland Railway Company, having previously been a miner at the Clay Cross Company Avenue Pit. He was also a postman working from the Old Tupton Post Office. Walter answered the call to arms at the start of the war, by Lord Kitchener, joining the 1st Gloucestershire Regiment in September 1914. 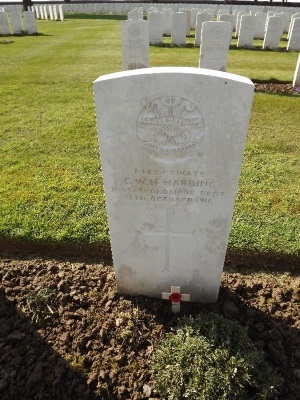 He proceeded to the front in February 1915, and was killed in the Loos area, on the 8th October 1915, aged just 21. Walter had a younger brother called Elesmere, who joined up when aged 15. He survived the war, and was a Tupton Resident up to his death in the 1980’s. 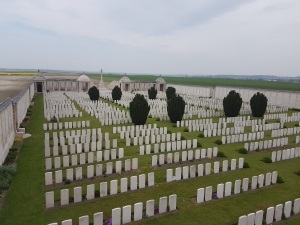 Thiennes Tannay Cemetery is located 1-mile West of the village of Haverskerque, which was a major supply depot during WWI It contains the graves of 378 British soldiers. William Thomas Bate is buried here. William was born in 1899 in Tupton. He lived at George Street, Hepthorne Lane, with his parents. Before the war William worked as a miner in the Clay Cross Company No. 4 pit. He is also remembered on the North Wingfield war memorial. 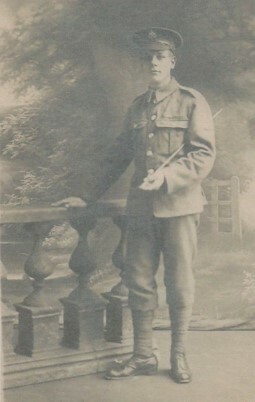 William enlisted in October 1917, joining the1st Battalion Norfolk regiment. He was only 18 years old when he killed on the 13th June 1918, during the German Spring Offensive. 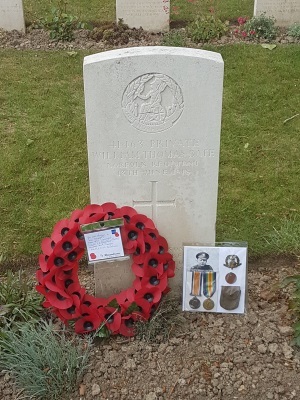 He was killed by shellfire whilst in a front line trench. William’s nephew was with us on this visit. David Parmley & Stephen Peters in Dorney with the flag at half mast.